It’s all very well talking about shifting the balance of services to community – but once it comes to resource shift the big statutory funders tend to default to trying to measure value using mechanisms that are usually variations of the ones that they use already to monitor big services like hospitals. Frankly, having sat on a number of NHS committees over the years I am not even sure whether this high level (usually activity) information really provides much of an insight into the effectiveness of these services anyway. It certainly offers little understanding on impact on population health. Here is an example of a report that the Sheffield Clinical Commissioning Group receives every month on performance – it is primarily fairly abstracted information on activity – it is hard to understand the relationship between this and demand and need. What is true is that for small voluntary organisations this approach to performance data is unhelpful, not least because their contribution can look too small compared to say the number of admissions to urgent care or the number of people seen by GPs everyday. I have been wrestling with this question for a while – because as the Chair of Citizens Advice Sheffield I want funders and other stakeholders to understand what we do and the difference it makes. This financial year we will probably help at least 26,000 individuals – I have made this assumption based on our half year report which is here. That sounds like a lot of people – but if you compare this against the total population of the city – some 560,000 people it looks relatively meaningless, it does not help funders and others feel confident that we are an essential service in the city. In other words we helped approximately 5% people in the city. the proportion of households we helped in the city is actually 11%. 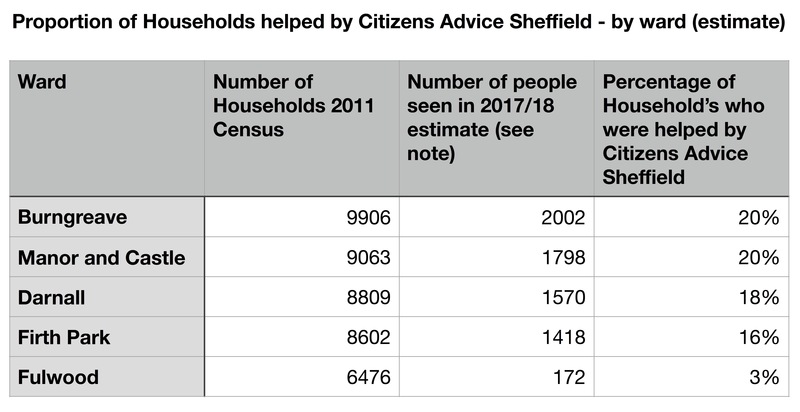 As the table shows in the poorest parts of Sheffield one in five people use the Sheffield Citizens Advice service! This is of course shocking and concerning – compare this to the number of people who use the service in Fulwood. Further it shows that rather than just being a worthy organisation who does good work but makes little difference – the Citizens Advice service has a population effect particularly in the most deprived parts of the city. This is a targeted and trusted service which is being used by some of the most stressed individuals and communities in the England’s 4th biggest city. If we are to see better utilisation of the voluntary sector – and particularly of their contribution to health protection then NHS England, Public Health England, Clinical Commissioning Groups and Local Authorities need to do develop better tools that capture the contribution of voluntary and community organisations. They could start by commissioning local organisations with the expertise – such as (good) councils of voluntary service and those with data handling expertise like Citizens Advice Bureau to work together to produce frameworks that capture voluntary sector data in a way that demonstrates local impact. 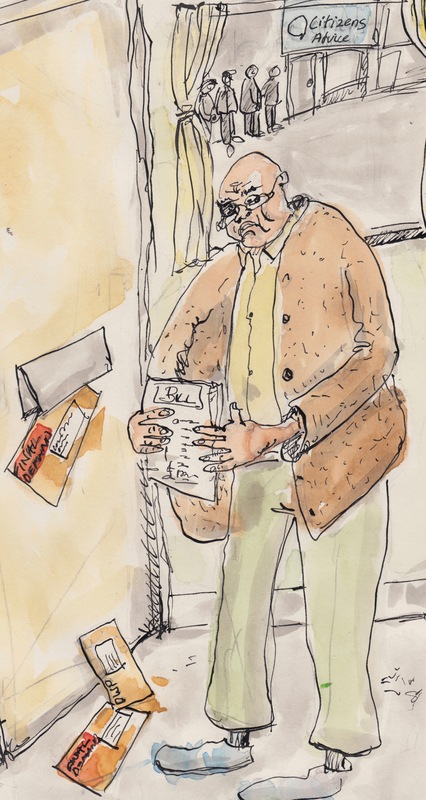 Of course beneath the utilisation data that Citizen Advice Bureau produce is a wealth of impact information on income increased, debts resolved and housing status secured – but there is not enough space in this blog to write about that! Thanks Mark, these stats show the important work that the CAB does, especially for the people who can’t afford to buy their own advice (who are probably also the ones most in need). After nearly 8 years now of “austerity” which has resulted in a steady transfer of wealth to well off from the less well off, and with the LAs increasingly deprived of funds for services, voluntary organisations like the CAB must be ever more vital. Keep up the good work please.